As a parent, I have to find a balance of serving foods I like (grown-up foods) and foods I know my daughter will eat. Serving grown-up foods is essential, as she won’t learn to like them without being exposed. But I do want her to actually eat dinner. I have found pizza is good ground for testing grown-up flavors. Kids love simple pizzas, such as cheese or pepperoni. While I’m not opposed to those, I prefer something a little more interesting. The white sauce pizza I shared last week goes over well with kids, as does this. I was honestly shocked when I saw my little girl downing the pesto, but she loved it. The artichokes can be a little much for some young palates. You may want to try just a pesto sauce with regular mozzarella cheese first, and then gradually diversify the toppings. This is my favorite pizza to make. Delicious and very simple, you can’t beat it. Enjoy! 1. Preheat oven to 400. Par-bake pizza crust if using this recipe. 2. In a food processor, combine spinach, basil, ¼ cup parmesan cheese, walnuts, red pepper, and garlic. Pulse until finely chopped. While processor is running, add broth/water, olive oil, and lemon juice. Add more broth, water, or oil if needed to make a paste-like sauce. 3. If necessary, chop artichoke hearts into at least quarters. 4. Spread pesto over pizza crust. Top with artichoke hearts, feta, and 1 tablespoon parmesan cheese. 5. Bake at 400 for 12-15 minutes, until crust is browned. Serve immediately. Recipe Notes: I like this pesto recipe, but you can use your favorite recipe or jarred pesto. It all works. Just be careful to not spread it on too thick. Also, it is important to par-bake the crust for this pizza, as the oil from the pesto can seep into raw dough, making it stick to the pan. 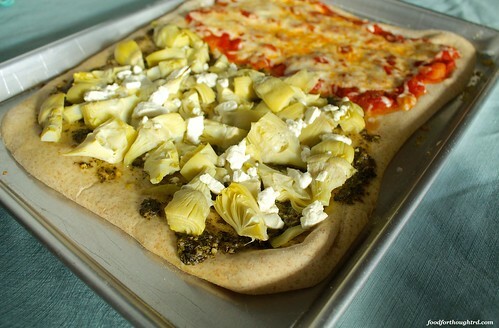 Please note that the picture is of a half pizza, but has a full can of artichokes on it. This many artichokes actually makes it hard to eat. Don’t worry if your pizza doesn’t look full of toppings. All of these toppings have strong flavors, so you don’t need as much to pack a good punch. Some chopped chicken also is good on this pizza.